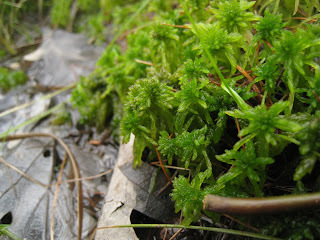 I took a walk through the Quaking Bog at Theodore Wirth park after work today. 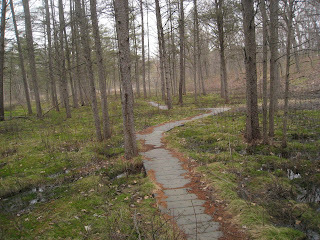 The Chorus Frogs were calling, White-throated Sparrows were singing, and I was sheltered from the cold wind blowing today. 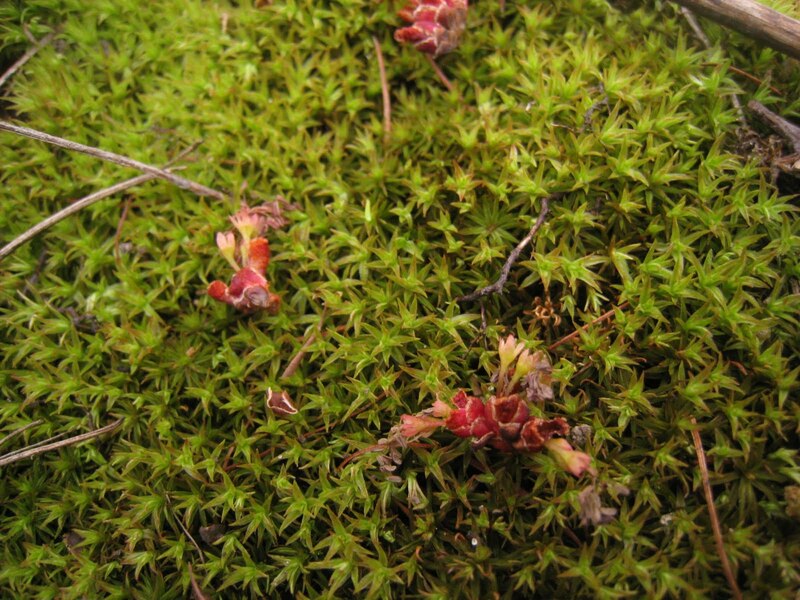 Below are some pictures of the Sphagnum Moss that make up the quaking bog. 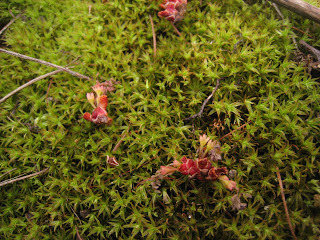 The "ground" in a quaking bog looks solid but it's actually sphagnum moss growing on top of layers of peat (dead, slowly decaying sphagnum moss) that is floating on the water. 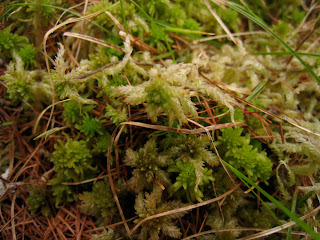 It is often firm enough to walk on, but quaking bogs are delicate places and too much traffic would damage them. And you could fall through and get really wet. 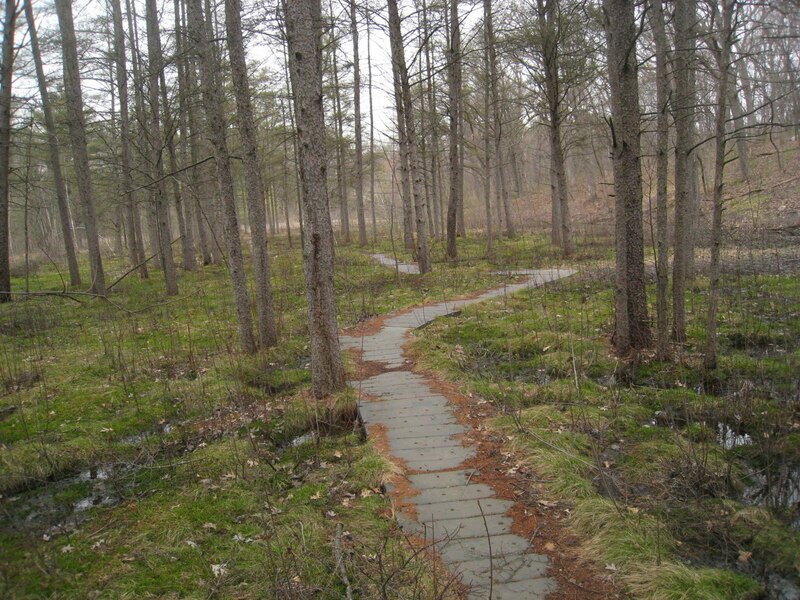 The bog at Theodore Wirth has a floating boardwalk to minimize the impact of visitors. 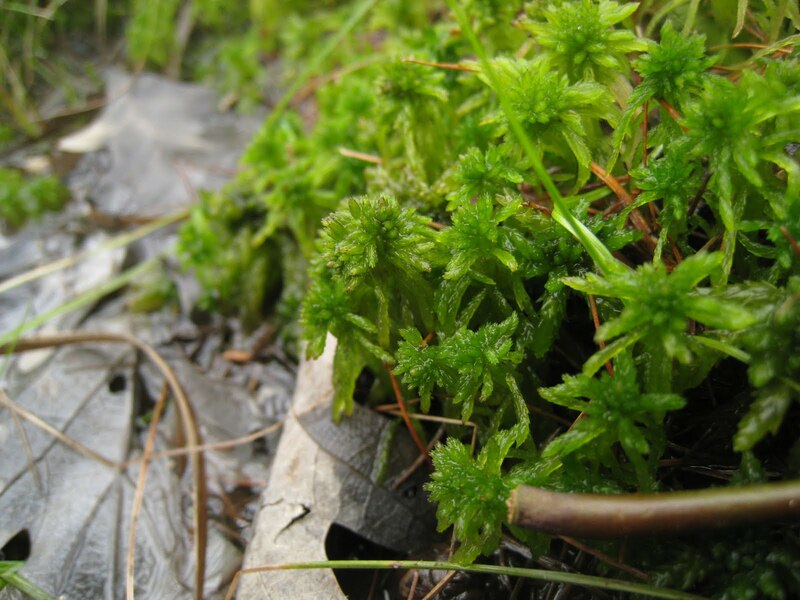 The waters of a quaking bog are poor in nutrients and low in oxygen. 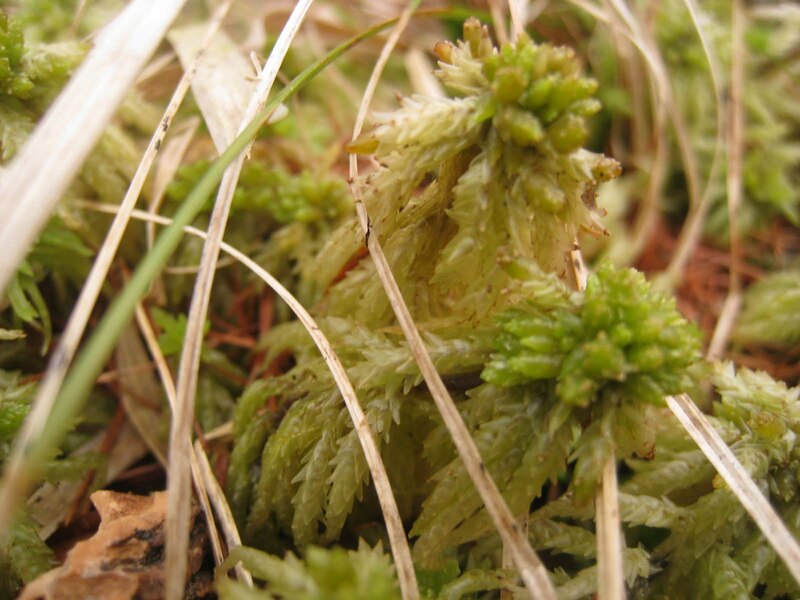 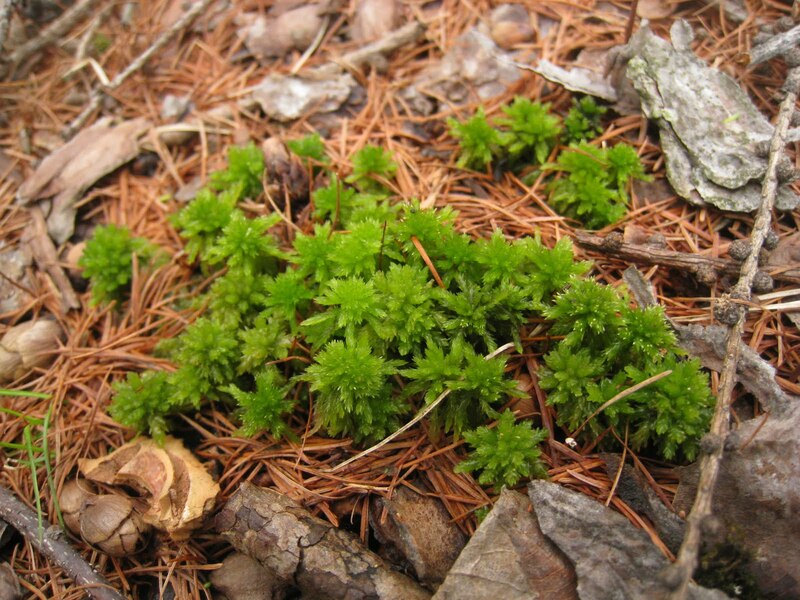 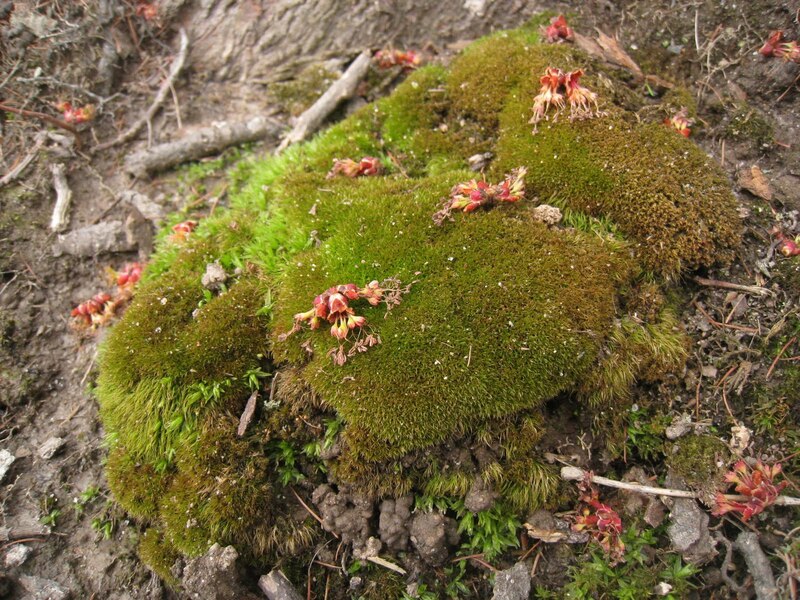 The sphagnum moss helps create and maintain this condition. Many plants that grow in quaking bogs have adaptations to help deal with these deficiencies. 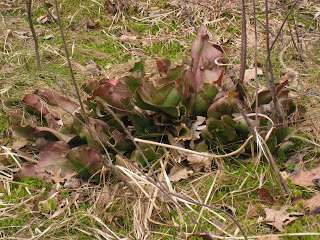 Pitcher Plants (Sarracenia purpurea) trap and digest insects in their leaves to supplement the low nutrients of the bog. 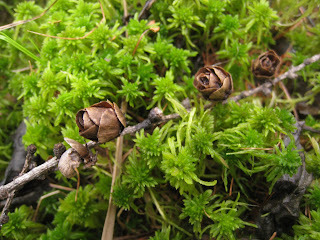 These are the cones of a Tamarack tree (Larix laricina). 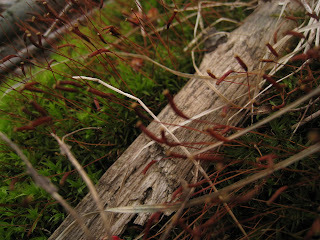 Tamarack roots grow near the surface of the bog to obtain oxygen that is absent deeper in the peat. Over time, new layers of peat accumulate at the surface. 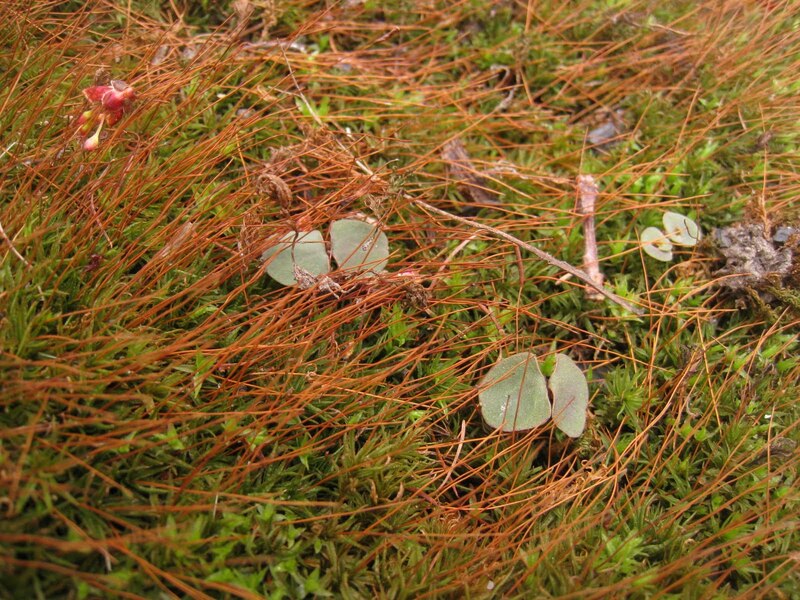 To keep their roots from being buried in the accumulating peat (and cut off from oxygen), Tamaracks grow new roots up at the surface. 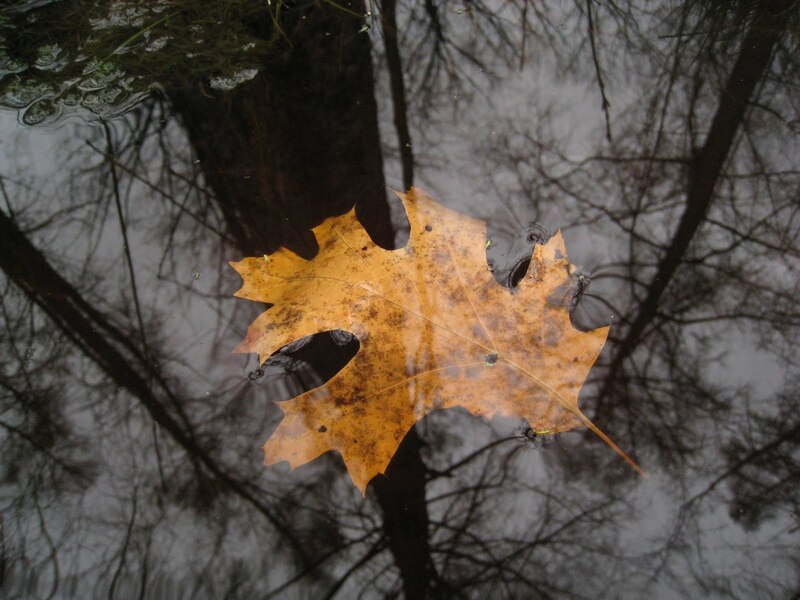 The water of a quaking bog is acidic. 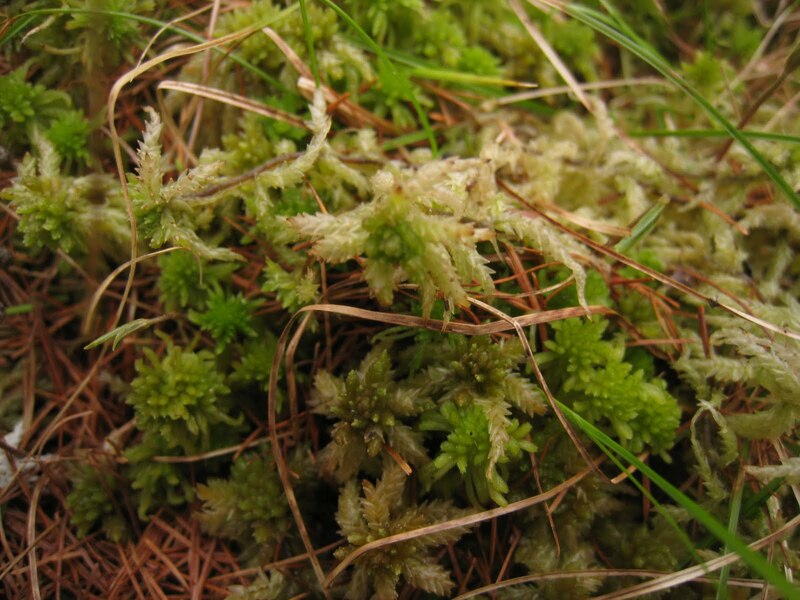 The acidity is promoted by the sphagnum, and the chemical process involved helps the sphagnum utilize the limited nutrients. 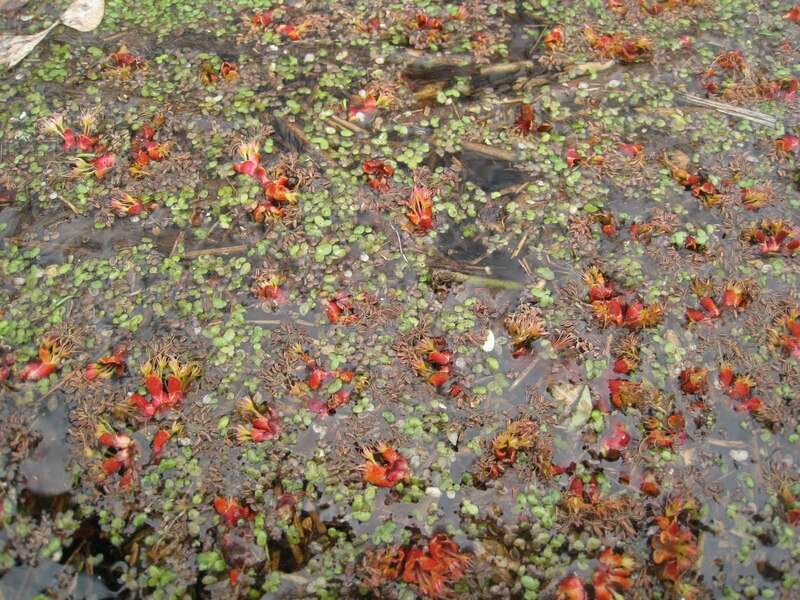 Every quaking bog I've been to (I've been to a few) has a moat; an area of open water between the solid ground and the floating sphagnum and peat. 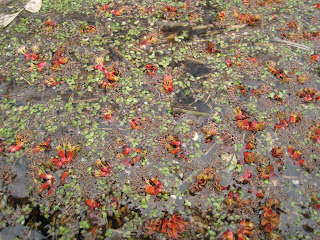 Some duckweed and maple flowers floating in the moat (crossed over by a little floating bridge). 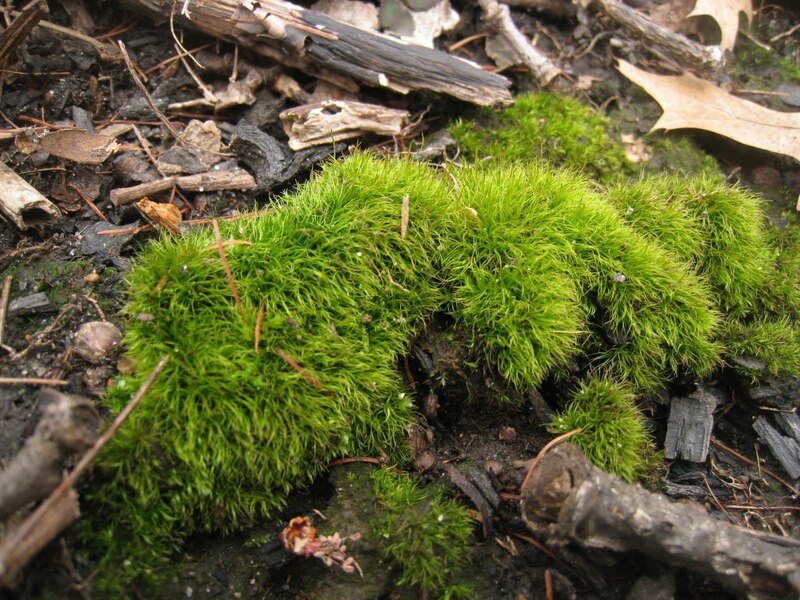 Now on to some moss on the land around the quaking bog. 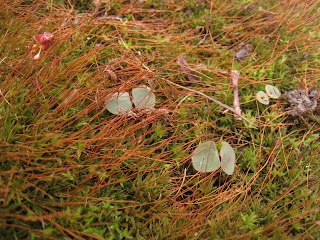 The little plants growing in the moss in the next picture are Jewelweed (Impatians sp.) seedlings. 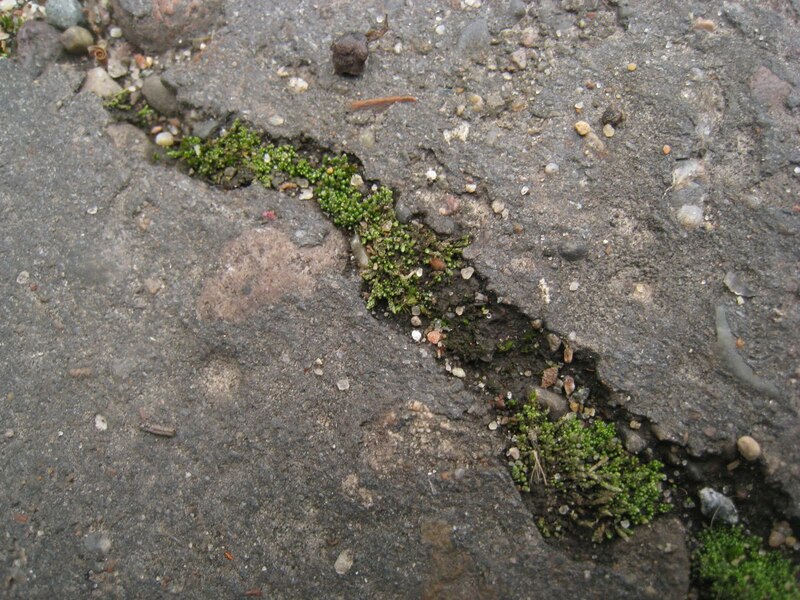 And finally, some moss growing in the cracks of the bike path that runs near the bog.